With my backpack shouldered I slowly drag myself up the street. A police patrol drives past me, then a car from a security firm. Then the patrol comes back. And yet another security car. This is how it’s been going on all the time, since I took the way up the Kakavos mountain in Greece. Help in translating the blog into English, French and Spanish is always needed. In case of interest, mail this list. If you feel insecure whether your language-knowledge is sufficient, maybe just give it a try and someone else has lass work correcting your output than that of the machine. Today and tomorrow (24th/ 25th February) once again representatives from a variety of police structures, from the companies arming them and from politics will meet in order to optimize the European police work. Press is strongly resricted (source in German). Some of the topics of this police state’s meeting are going to be the cooperation of public and private security agencies, standards for foreign assignments, armament, data evaluation, expansion of CCTV in public spaces, preventive policing and counterinsurgency (congress programme). First published in German on 11th February. 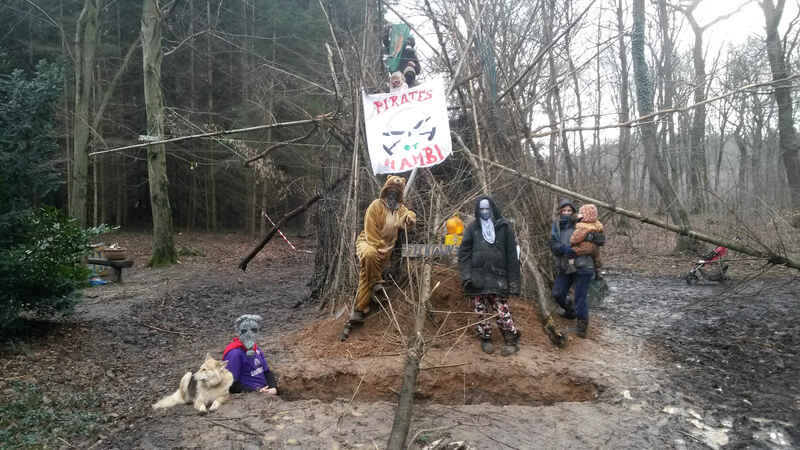 Hey folks, the Winter is approaching it’s end ans a new spring with actions in and around the Hambach Forest is coming up. In the Forest Festival on 4th and 5th April 2015 we will celebrate three years of forest- and meadow occupations, and subsequently there will be another Skillsharing Camp from 6th until 12th April 2015. For further infos on the Skillsharing Camp, click here. Since a few days, shelters a spiky hedgehog, blocking one of the main crossroads in the Hambach Forest. It’s a type of watchtower, surrounded by other barricades and trenches. The barricade, which is occupied 24 hours a day, was visited this morning by RWE Security-Forces. Unfortunately, they also came very close to the squatted meadow and therefore had to be accompanied out of the forest by some people. In the last days, increasingly often security guards patrolled the forest on “our side” of the closed down highway. Yesterday, the climbing rope of the Beechtown-Occupation was cut again.